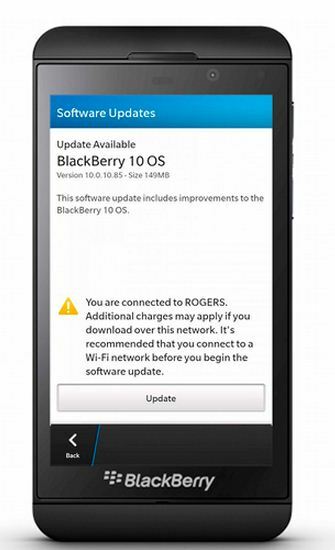 Blackberry sent the first software update for their Blackberry Z10 device, which was the initial Blackberry 10 version to 10.0.10.85 version that is said to have got a lot of improvements and changes from the default BB 10 OS version. Following are the best changes and improvements that a user had noticed after the BB 10 update was done on their Z10 device. The Blackberry Z10 users who have struggled and complained about the issue with the battery life, now gets more hours with the same charging cycle as earlier, as according to Blackberry, there were around 60 improvements done in the battery section. The time taken to charge the Z10 remains the same, but the hours needed between the next charging has got higher. The update has brought a lot of improvement to the third party apps too, where the app integration and the performance gets better and the 3rd party apps got faster than earlier, enhancing the user experience. It is also reportedly said that the Whatsapp messenger too would be available. The 8 megapixel camera of the Blackberry Z10 device was not known much for the Low-light photography, but according to many users, there has been quite a lot of enhancement in it and better pictures in low-light conditions were being captured. Other issues of the cameras were also fixed, and pictures now have got a better resolution. There was quite a lot of fixes in the Blackberry Hub section, which was having issues with the contacts importing and managing. Blackberry being known for the easiest communication and contact handling in the market, has sent a lot of improvements in this section, and now there are easier and better ways to import contacts from the online database, and it would be a better logging of the calls made and received. There are quite a few fixes and improvements in the Gmail accounts too, as Blackberry is again a device known for the mail app and it had to get better. The media playing through the browser was a possibility earlier too, but there were a few minor glitches in the browser when heavy videos or media files were being played. Blackberry Z10’s OS update now has made the browser experience better for the video playback to its maximum potential. Although the update came out pretty well, there were a few issues people were still reporting and Blackberry has to keep a check on that and work on fixing it in the next update. A few users reported of no changes in the battery life, and the problems in the browser being the same as earlier. Since it is an Over-the-air update, you just need to go to the settings section where there is an option for Software Update, and in that, Check for Updates and you would see the latest version of the Blackberry 10 OS available for updating. The size of the update file is around 150 MB, so it would be better if you use Wi-Fi or a 3G connection for the quicker downloading of the update.